The TCU Justice Coalition wants students to share stories about diversity, equity and inclusion – good or bad – on social media using #DearTCU. The student-based coalition wants to use the hashtag to engage the administration in a conversation about the experiences students face on campus. People are welcome to take a picture by Frog Fountain using the hashtag #DearTCU from 11 a.m. to 2 p.m. Friday or 2 p.m. to 4 p.m. Tuesday. 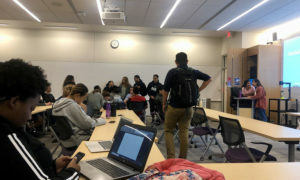 TCU Justice Coalition members, who want to make TCU a more welcoming campus, met Thursday to discuss their course of action. The administration can be characterized as lacking commitment to the dialogue that so many students on campus crave, said Ellen Andrews, a sophomore and president of the Panhellenic Council. The group is also working with the Diversity, Equity and Inclusion (DEI) committee to create a strategy to engage students in discussing these issues with faculty across all academic departments. DEI leaders want to broaden the Core Curriculum to include more offerings pertaining to diversity. Hope Bentley, senior and co-founder of the coalition. Photo via Oscar Hernandez. It will present the DEI’s proposal to the Student Government Association on Tuesday and ask for its support. Students sit during the TCU Justice Coalition meeting. Photo via Oscar Hernandez. The goal of having the DEI as a component core is to have an avenue that addresses diversity in every major so that it is applicable to student’s lives and major. 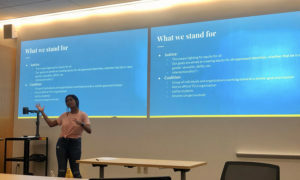 The coalition provided handouts with key topics for students to discuss with their professors about issues regarding DEI, such as ways students may sometimes encounter implicit and explicit bias, and prejudice on TCU’s campus.